Joyce passed away at 08:50am Saturday 29th January 1911 at the Pacific Heights Nursing Home Sylvania, New South Wales, Australia. She had been suffering from Pancreatic Cancer. Joyce Rose Eatch died 29 January 2011 at the Pacific Heights Nursing Home, Sylvania, New South Wales, Australia. Joyce Rose Butcher, is the second child of Albert Edward Butcher and Gladys Rose Kirkwood. she was born on 23 March 1926 at Waterloo, New South Wales, Australia. She lived and grew up in the Bexley area of Sydney. Joyce was a tailoress by trade, making suits, uniforms and worked for David Jones. Where she was employed at there clothing factory at Marlborough St, Surry Hills from 1939 to 1952. Joyce, sometimes, during her lunch, walked down to see Rachel Burcher. She was very fond of her Aunty Rae, who was popular with all the family. Joyce visited John and Rachel Burcher at 88 Baptist Street and was there a couple of days after John Humphrey Burcher's accident. She met Lola, John Humphrey's wife at the the Wake. Joyce, followed her parents love of music and sings, she sang soprano, being able to reach the highest notes. In the early 1940's during World War two, Joyce was singing at radio 2UW, and later sang at functions, such as weddings. She use to sing with the Walter Kingsley singers, some of their members went on to sing on shows such as "The Bobby Limb Show". 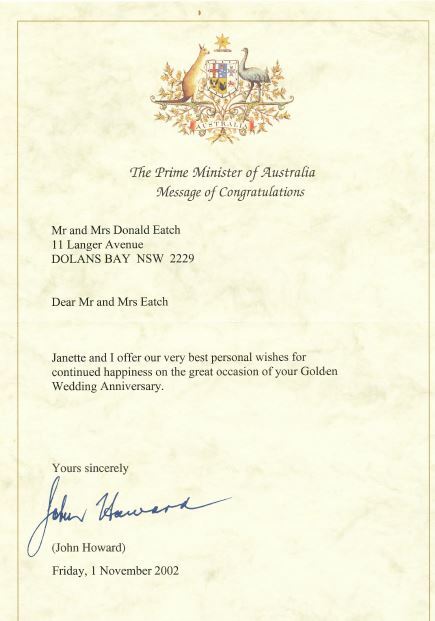 Joyce married Donald Campbell Eatch on 8th November 1952,at the Presbyterian Church, Bexley, New South Wales. Joyce and Donald had two children Suzanne and Julie. Albert and Gladys were Married at St Pauls Church of England Redfern New South Wales on 10th November 1923. Certificate number 13481 dated 08 October 1973. Joyce Eatch Sing on Radio 2UW. This was during the second World War in the early 1940's. [S89] Julie Rose Tucker (n. Eatch) (Reliability: 3). [S4] NSW BDM, New South Wales Government, Reg. No. 106234/2011 (Reliability: 3), 14 Feb 2011. [S89] Julie Rose Tucker (n. Eatch) (Reliability: 3), 29 Jan 2011. Julie was at the Hospital when her mother died. [S90] Joyce Rose Eatch (n. Butcher) (Reliability: 3), 10 Nov 1923. My mother and father were married 10 Nov 1923 at St Pauls Church of England, Redfern, New South Wales. [S4] NSW BDM, New South Wales Government (Reliability: 3), 10 Nov 1923.